Cancellation > 3 days before 50% charge for whole booking. Cancellation within 3 days/No show (without any announcement) will be fully charged whole booking. 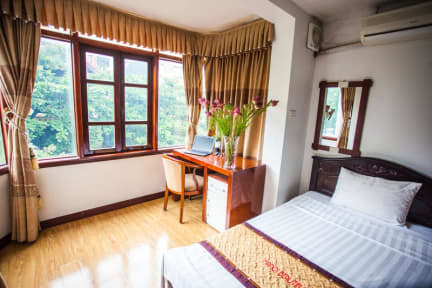 Owned and run by a westerner, Hanoi Old Town Hotel guarantees a truly amazing stay in Hanoi, one of the most exciting, vibrant and captivating city in South East Asia. 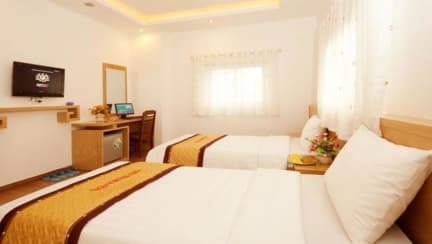 Located centrally in Hanoi Olds quarter, Hanoi Old Town Hotel offer 28 luxurious and boutique rooms with full of modern and well-equipped furniture which meet all guests standard for a three stars hotel at great price. All our staff are trained methodically and professional. Each has many years experience in tourism as well as a high knowledge in hospitality. With such a wonderful team, we assure a smooth and pleasant stay for our lovely guests. At Hanoi Old Town Hotel, we also offer the best priced, highest standard tours and travel for Vietnam. Our tours are guaranteed great value;breakfast, tea and coffee available all day, restaurant catering both Vietnamese and Western cuisines. Perfect place to stay in Hanoi, Great location and such helpful staff. The staff really went the extra mile for us on many occasions. 100% will return. Hanoi Old town Hotel was perfect for my wife and I while on holiday in Hanoi. The staff was AMAZING, warm, friendly, welcoming and answered numerous questions via email before our trip, including booking our transit to and from the airport and to an overnight excursion to Halong Bay. The rooms were very spacious, clean, and orderly, the lobby was very comfortable. And the location was perfect for all of our sight seeing needs. And the hotel is a great value for the price. Great value for money! The hotel is few steps away from the night market, in the old quarter with lots of people, traffic and noise 24/7 - if you are looking to be in the middle of bustle - this is a good place. The A/C in the room works great and the bathroom is very spacious with good amenities. The entrance to the hotel is on the second floor, need to take stairs for 1 floor ( from the reception you have an elevator). Daily housekeeping is great and cleanliness is on the very good level. We stayed in the double single room. Super clean with balcony. Super warm shower with a softer mattress than most we have stayed on in Vietnam. Would have liked a free breakfast but it forced us to explore the abundance of food options in the Old Quarter which was good. No real hangout place except for the dining area which is the same as the reception area. Nice place to stay in central downtown Hanoi for a few nights if you want to relax and chill out. Very friendly staff. Rooms were nice, with good beds and good A/C.